The “River Return” portal at Mission Concepción features limestone walls that rise and fall, mimicking the flow of water. The concrete pavement is etched with similar wave-like swirls so it appears to flow seamlessly into the landscape. A close-up view of the beautiful combination of stained and exposed concrete. The concrete was stained first, followed by painstaking needle scaling work that took months to complete. Once the engraving was finished, Sundek crews returned to wash the pavement and apply two coats of clear sealer and nonslip grit. An overhead view of Mission Concepción, showing the swirling pattern of the walls and pavement. 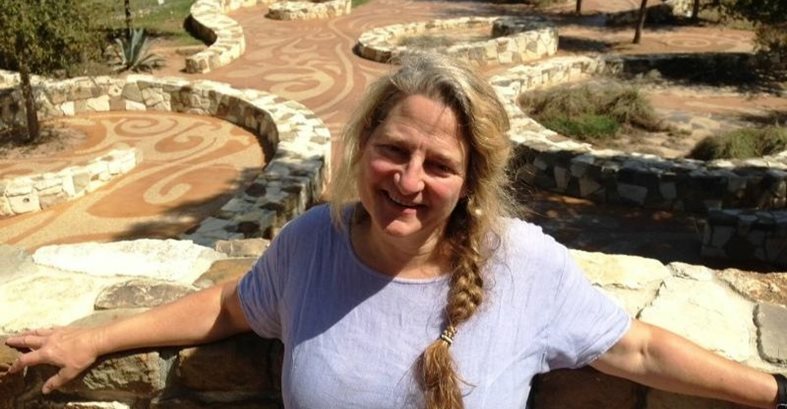 Environmental artist Stacy Levy developed the vision for the project. “I'm really interested in art being more like a verb and less like a noun,” she says. 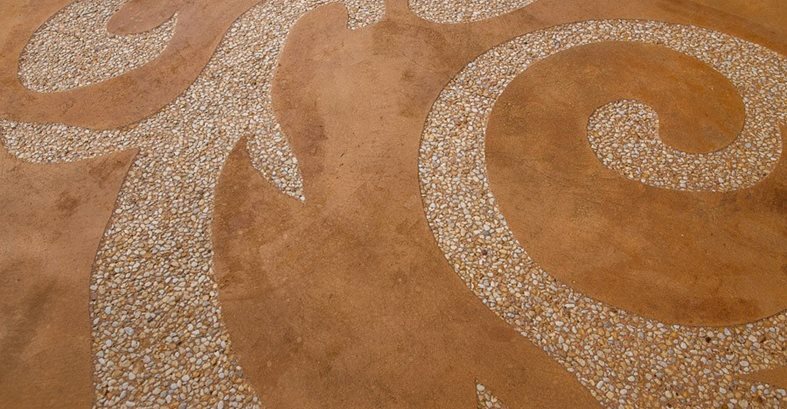 Few people think of engraving as an artistic technique for concrete, but when it’s done in combination with staining to reveal a detailed pattern of exposed aggregate, the results can be stunning. 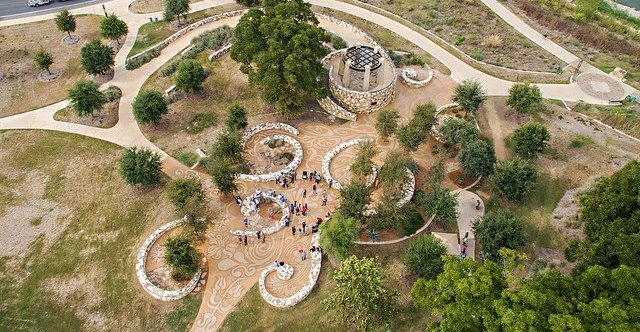 For Mission Concepción Park in San Antonio, Texas, a 7,000-square-foot area of the park’s pavement received this synergistic combination to create an intricate, swirled design that mimics the swirls and eddies of the nearby San Antonio River. The project garnered the WOW! 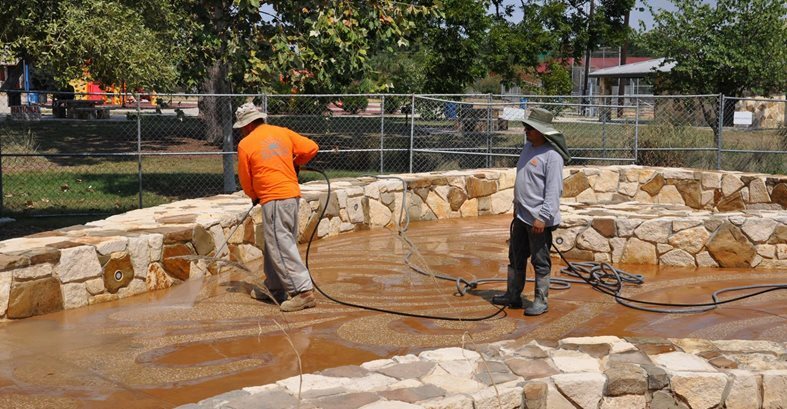 Award for best overall project from the Decorative Concrete Council as well as a first place award for concrete artistry (see 2017 Decorative Concrete Awards). This artistic endeavor, also known as “River Return,” involved a combination of talents that started with the vision of environmental artist Stacy Levy, the acid staining expertise of Sundek, and the engraving skills of Blazing Lazer Art & Engraving. The Mission Concepción portal tells the story of the establishment of the five Spanish Missions and announces one's arrival at Mission Concepción from the San Antonio River. Levy’s design intent was to incorporate the wave-like swirls of the river into the existing concrete walkway so it would appear to flow seamlessly into the landscape. The pavement was stained by Sundek first, followed by months of using a needle scaler to blast away the surface following Levy’s design template. 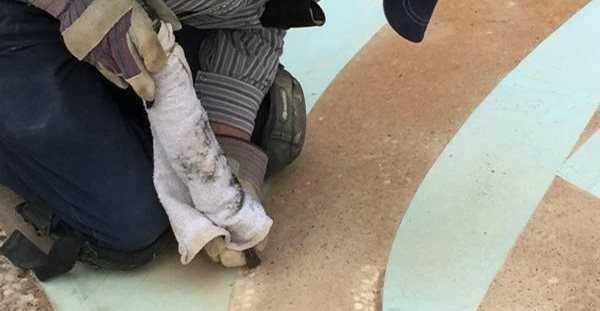 The painstaking process took about 10 months to complete, but the result was a permanent piece of art that will endure the park’s heavy foot traffic. “The San Antonio River flows through the city, its liquid presence flowing past the hardscape of the urban environment. This wonderful contrast of liquid nature and solid infrastructure is intriguing. I wanted to capture the feel and look of flowing water and show people these patterns of fluid motions," says Levy. 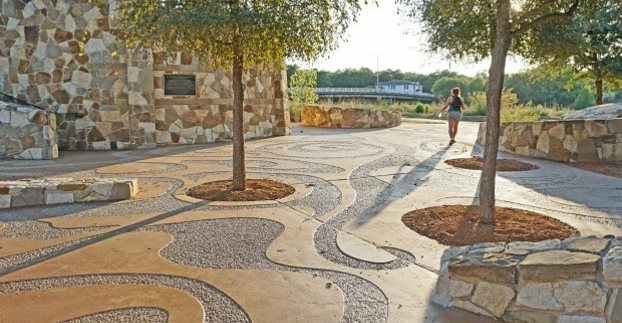 The beautiful transformation from a plain concrete pavement to the dynamic stained and engraved design creates an interactive experience for park visitors. "It's going to be fun for kids to run around it and trace around it. That's what I would've done if I was about 10 years old and I got to have a floor like this in my park,” says Levy. “I'm really interested in art being more like a verb and less like a noun, so instead of making a thing I make an experience whenever I can." Learn more about concrete engraving.